For those of us that drive an older car or truck, we sometimes have to do without the latest mod-cons when it comes to our in-car entertainment. If we want to stream music from our smartphone or MP3 player, we need to rely on the best auxiliary cable we can get our hands on. Luckily there are a mountain of choices out there to choose from. So whether you've just discovered the miracle that is Spotify Premium. Or you've spent the past 6 months painstakingly converting all of your old LPs to 192kbps MP3. You may be in the market for a new auxiliary cable to hook up your music to your car stereo. What Is a Car Auxiliary cord (alternate version)? What Is An Auxiliary Cable (Boring Version...)? What if I don't have an auxiliary socket or Bluetooth? My favourite at the moment is the iVanky AC-01. I've been using it pretty much everyday for the past year, and I honestly can't fault it. On the outside they all look the same (or very similar). Some are covered in sparkly colors, some are just black. Some have gold plated plugs and copper insulators, some are just black. So how do you pick the best aux cable? Unless you are buying a cable as in investment, and plan on stripping it down for its precious metals the next time we hit a recession...you're better off making decisions based on sound quality and price. Here's a few things to look out for. 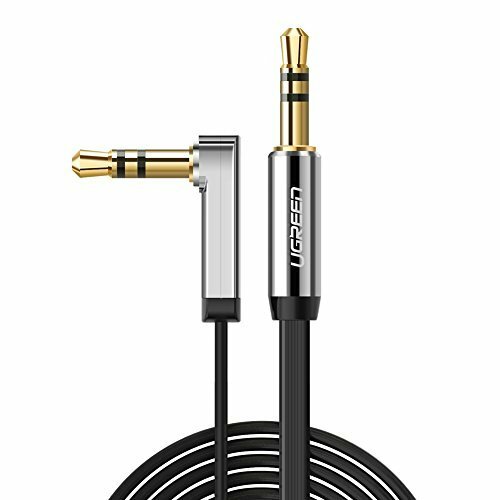 Price - Most auxiliary cables will come in at under $20. There are plenty of great options for under $10. If you are only buying one cable, then the price probably won't matter. 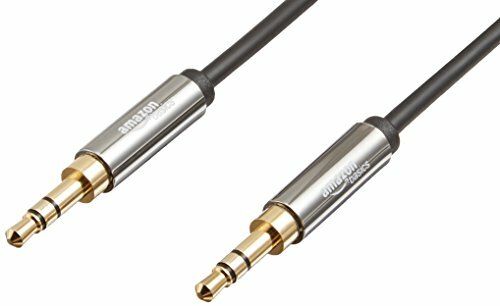 Sound Quality - Not everyone is an audiophile, and you may just want the cable to listen to audiobooks. Either-way, sound quality can be a subjective thing, so try and read as many reviews as you can before making a decision. Compatibility with my Car - If your car has an auxiliary socket then it will usually be a 3.5 mm socket. Headphone jacks are all the same too. You may want to check the length of the cable, to make sure it will reach from the socket to your device. Or you may want to hide it away down the side of a seat or under some trim, so some extra length might be handy. As I said earlier, I've been using this cable in my own car for over a year now. I'll be honest, I'd never heard of the name iVanky before I bought it, but it sounded kind of cool so that's why I picked it...That and the huge number of great reviews it has received on Amazon. So far both are still working and I honestly can't fault the sound quality, or cable quality it self. The cable is light, flexible and feels nice to touch. The outer coating of the cable has that rubbery PTE feel that makes it feel more expensive, but stops it from kinking. The cable is also available with a super slim braided outer coating. 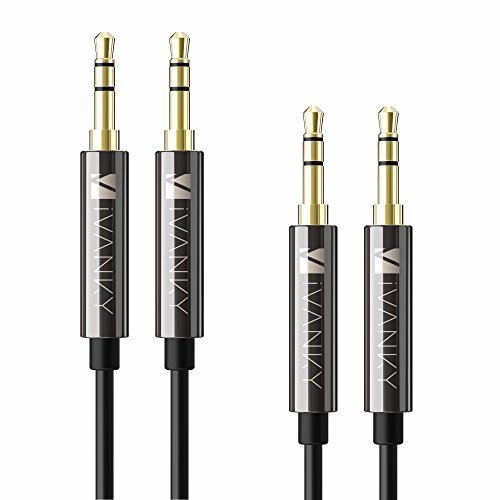 iVanky say in their specs that the cable has a pure copper shell to enhance sound quality and reduce signal loss. It also has gold-plated connectors, to ensure excellent transfer of the audio signal. I've always been a bit skeptical of whether or not these make a difference, but hey I'm not going to say no to some precious metal to add to my doomsday collection! If you are connecting to a smartphone with a cover then the slimline plug should easily fit through the opening. It's a straight connector too, so thick cases shouldn't impede the plug from making a snug connection. The length of the cable is also just right too. The auxiliary socket on my car is in the arm rest, so a 4 foot cable is perfect for resting my smartphone on the passenger seat. If you are looking for a longer version, it's also sold in a single pack 8 foot length. Anker produce a huge amount of accessories for portable audio devices. I have used their Bluetooth receivers in a few different cars and can't fault them. Couple the bend-ability with the 'Aramid-Fiber reinforcement' and you've got a fairly indestructible cable on your hands. Just like the iVanky cable, the plugs are thin and long with a sturdy chrome outer casing, so they should withstand a fair bit of punishment. From reading through the reviews on Amazon, there are reports of this cable failing after a while for some people. It's not clear why, but Anker customer service appears to be excellent, so there are no worries when it comes to getting a replacement. There isn't really anything outstandingly different about the Amazon Basics cable. I'll be honest, I haven't used one personally but it looks like it can do the job just like the others. It comes in a number of lengths, up to 8 feet. It has gold plated, thin plugs with a chrome body coating. The cable itself features a flexible outer coating just like the Anker and iVanky cables. Probably the biggest selling point of the Amazon Basics cable is the 1 year Amazon (limited) warranty. If it breaks within a year, and you're bothered sending it back, you know that Amazon will look after you. Apart from that, it's just a standard auxiliary cable, but looks like good value to me. It's cheap, so don't expect it to last a lifetime. 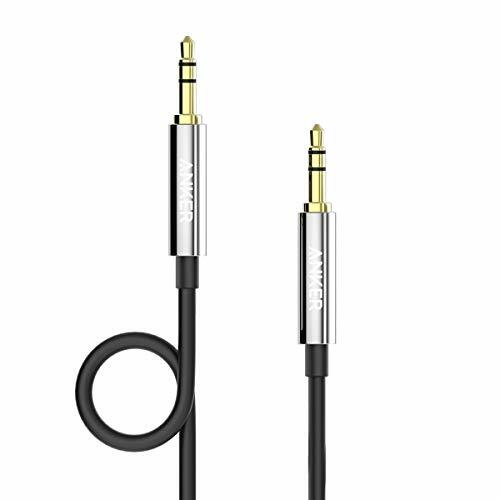 If you do a search for Cable Creation on Amazon, you'll see that they sell all sorts of cables, connectors and chargers for portable devices. They even have their own website. I like to buy from sellers that design and build their own products. Cable Creation look like a company that take pride in their creations, by creating nice looking, yet functional cables. This Cable Creation cable is available in rose gold, black and white and plain black. The rose gold is eye catching. Combined this with the soft touch, flexible outer coating and we've got a premium looking product. Beyond this, there's nothing too unusual about the materials used, or the shape and design of the plugs. It should work with any 3.5mm socketed device, even if it has a thick case. This cable is also available as a coiled version. This can be handy if you are using it with headphones, or if you are just a bit of a neat freak and don't like excess cable lying around! It's cheap, so I wouldn't be expecting it to last a lifetime. This cable from UGreen is the business when it comes looks. It's a sleek flat design, so as well as not tangling, it will sit nicely in most cars and be almost invisible. The chrome finish on the plugs is a nice touch too, giving it a more premium look and sturdier feel. If the auxiliary socket in your car is hidden away in the arm rest it can be difficult to find a cable that will allow you to close the arm rest when the cable is plugged in. This is where the 90 degree plug comes in handy. It allows you to plug the cable into tight spaces, without having to over-bend the it and possibly damage it. It also allows the cable to run flush against the dashboard if your cars aux socket is on the front of the head unit. UGreen claim that the oxygen free copper used in the cable allows for better conductivity, and therefore better sound quality. If you read through the ​reviews left by customers, one guy actually measured the electrical characteristics of the cable and seemed impressed, considering the low price. Overall this is a nice looking cable, that has a few advantages over standard cables. 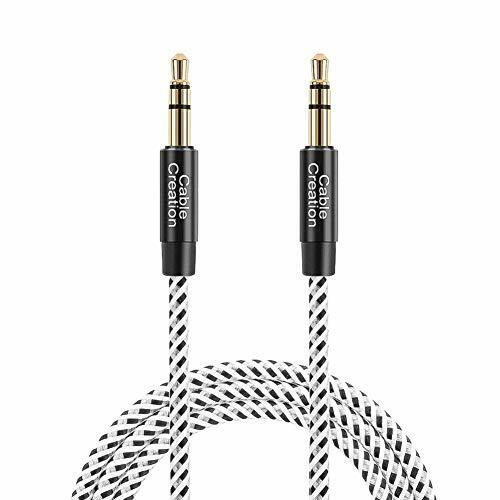 It's available in a few different colors and is no more expensive than the other cables I recommend. Ok, so this one isn't strictly a 3.5 mm auxiliary cord. It's an adapter that allows you to connect your Apple device, that has no 3.5mm socket to your car using an auxiliary cable, via the lightning port and charge it at the same time. There's a mouth full! 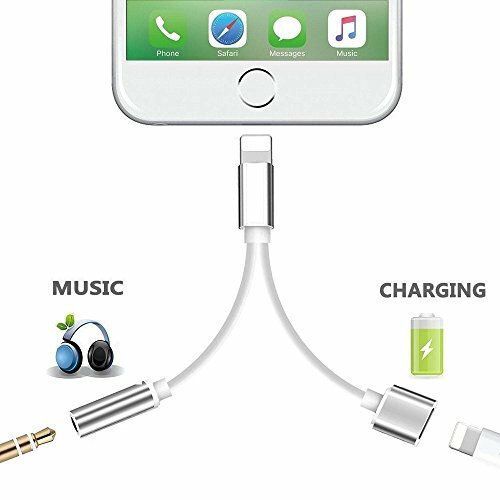 The adapter that ships with new Apple products, only allows you to use the lightning port as a headphone socket. If you want to use it to charge the device, you need to plug out the adapter and plug in the charging cable. Now I know Apple are pushing for us all to start using Bluetooth devices to stream music and audio, but not all of us have Bluetooth enable stereos in our cars. So this little adapter is a nice work around. The RockXdays adapter is a neat little cable. The conversion from digital lightning signal to 3.5 mm signal is done using a tiny audio chip, embedded in the cable. You'll need to make sure that you use the original charger that came with the phone, or a max 2amp approved charger so as not to damage the chip. This adapter doesn't allow you to control things like volume or track selection, so you'll need to brush up on your Siri skills for that. You also can't use it for making calls. Apart from that, you just connect up a standard 3.5 mm cable and you can output audio through your car speakers. You need to be careful which charger you connect to it. Ok so let's pretend that you have just arrived to Earth from the distant planet Eros. It's been a long journey, but you're glad to be here, Eros was too cold. Soon after you arrive you realise, you're going to need a little run-around. Something to drop the kids to school in, maybe use it for picking up some groceries, or a new lawnmower. That house you rented has a jungle for a back garden. So you check out Craigslist, and before long you're the proud owner of a low mileage 1998 Ford F-150. But your excitement soon turns to despair. Hang on a minute, does this thing not have bluetooth, or a touchscreen, or a decent sized cupholder? How the heck am I going to listen to the latest Justin Timberlake album I just bought on iTunes? Your despair quickly turns to panic. The guy you bought the truck off isn't answering his phone. What are you going to do? And then you see it. This black cable like thing hanging from under the dash, with a small gold plug on the end of it. Hmm, I wonder... So you fire up Google and after a quick search, hallelujah! There it is, it's an auxiliary cable! You plug it in, and before you know it, you are listening to Justin through the F150's speakers in all his funk-soul glory. Hallelujah! A car auxiliary cable is a length of wire with one or more plugs on each end that will connect a portable device to a car stereo system. Yawn. Most car's in the past 10 years will have an auxiliary socket somewhere on the head unit or dashboard. Some hide it away in the arm rest. The cable connects into this socket and into the headphone jack on your device. This connection allows you to play music or any audio media on the device through your car’s sound system. I've used it to listen to Kindle audio books and it's also a handy way to amplify directions from the Google Maps app when driving. It's really the cheapest way to 'upgrade' your sound system. The big downside is that by itself, an auxiliary cable won't give you handsfree functionality. You can't use it to control stuff like the volume or to skip tracks. You still need to control everything via the phone or MP3 player directly. You can or course control your phone using voice commands. I've an Android smartphone, and I've been trying out Google Voice for the past few months. There are lots of other options out there too. If you have an Apple device then Siri is all you need. If your phone doesn't have a headphone socket, you can buy a Bluetooth receiver instead. This connects to the car auxiliary socket and converts the sound to a bluetooth signal. You just pair your phone and away you go. If your car doesn't come with an auxiliary socket then there are other options available to you. Probably the easiest solution is to purchase a Bluetooth FM transmitter. This will allow you to stream audio via your smartphone or from a memory stick through your existing stereo. You can also install a permanent auxiliary cable. Some car stereos will have an auxiliary socket buried away somewhere behind the dashboard on the back of the stereo head unit. This will usually be specific to the car, like this one for a BMW E46 3-Series. Another option is to upgrade the head unit. This is the more expensive option, but may be better in the long run if you plan on upgrading other parts of the stereo system. Depending on your vehicle, you have the choice of installing a single din or double din head unit.